Greetings from the Patriot Pole Vault Club. 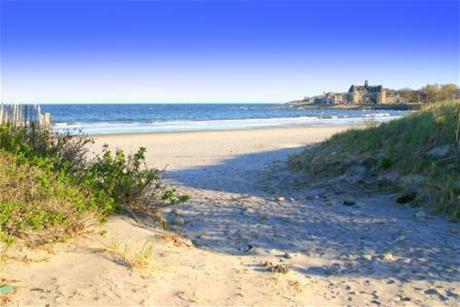 We are extremely pleased to announce that the 2013 New England Beach Vault will be held on Saturday, September 21st on Narragansett Town Beach in scenic Narragansett, Rhode Island. Flight #1 is for athletes opening at heights lower than 11 feet. We can start as low as 4'. Warm-ups for this flight will begin no later than 9:00am with the competition beginning at 10:00am. The cost for this event is $50 and includes both entry fee and a New England Beach Vault t-shirt. Entry without a t-shirt is $30. Payments will be done on site. Checks may be made out to "Patriot Pole Vault Club"
USA Track & Field membership is required to participate in this meet. You may sign up for USATF membership at the meet if necessary. While on-site registration will be available we STRONGLY suggest pre-registering online ahead of time to help us get an idea of how many vaulters to expect. - Feel free to bring food and make this a "potluck pole vault meet"
As with all outdoor meets, a lot depends on Mother Nature. We are working on having a possible rain-date, but we may have to cancel in the event of poor weather. If the event is cancelled, we will make the call the day before. An email will be sent to the address associated with pre-registered athletes. We will also post updates on our website, our Facebook page and our Twitter feed. We look forward to seeing lots of you vaulting ON THE BEACH!